Allyn Jaffrey Shulman opened for a raise to 16,000, and Stephen Chidwick repotted to 60,000. Shulman made the call after everyone else had folded. The flop came , and Shulman must have liked what she saw because she moved all in, covering Chidwick. Chidwick tanked for about two minutes before softly pushing his cards to the dealer. Tyler Nelson and Stephen Chidwick got all the money in before the flop. Nelson was holding and we only saw Chidwicks . Either way, the board ran out and that was good for Nelson to get a full scoop for both the high and low. He's up close to 200,000 while Chidwick is hurting for some chips with just about 120,000 left. Just after the flurry of Ari Engel's bust, Dylan Linde was also eliminated. We missed the action, but for his deep run Linde will collect $10,699. 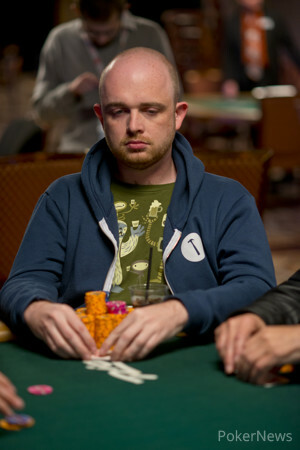 Action folded to Joshua Weiland who potted from the button to 28,000. Zhen Cai in the big blind repotted and the two got it all in. The board ran out giving Weiland a seven-high straight and a deuce-three low, that was good enough to scoop the pot for a double. 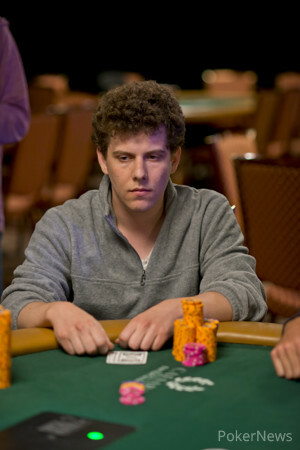 Allyn Jaffrey Shulman check-called a bet from Joshua Weiland after the flop. She then check-called again for the last of Weiland's chips after the turn. Shulman had the lead for low, and both players had the same straight draw, but a high card would give Weiland the whole pot with ace-jack high. Unfortunately for him, the river was the , giving both players their straights but Shulman the low, so Weiland only collected a quarter of the pot. 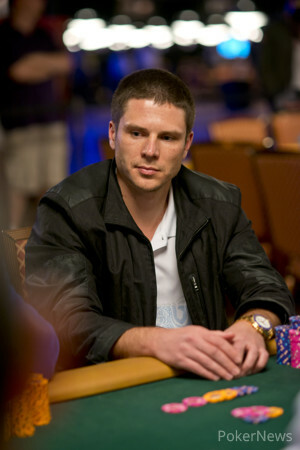 Ari Engel popped things off with a raise to 28,000 only to find a raise from Stephen Chidwick to 48,000. Action folded around and Engel met him with a call. The flop came down and Engel moved all in for his last 27,000. Chidwick snapped called and the two turned up their hands. The turn was the giving Engel the nut straight and leaving Chidwick drawing dead to any part of the pot. The river was the meaningless and that was it. Chidwich was forced to cut out a piece of his stack and ship it over to Engel who got a much needed double up. Players have arrived and play is set to begin. Seventeen players remain in contention for the $279,094 first-place prize and a World Series of Poker gold bracelet here at Event #46: $3,000 Pot-Limit Omaha Hi-Low 8-or-Better. Plenty of well-known names dot the short list of survivors, but a relative unknown leads the way: Alexey Makarov, a Russian player who who will log the biggest live cash of his career with any finish better than ninth. Makarov bagged 471,000, giving him a slim chip lead over Ashly Butler, a New Orleans native who sports a third-place finish in last year's WSOP that netted him just over $100,000. Notable players who have managed to survive the first two days include "Miami" John Cernuto (sixth place, 271,000), Stephen Chidwick (seventh, 243,000), Andrey Zaichenko (ninth, 219,000), Allyn Jaffrey Shulman (10th, 172,000), Mel Judah (16th, 89,000) and Ari Engel (17th, 75,000). Cards will be in the air at 2 p.m., and the field will be whittled down to a champion, who will have conquered a starting line-up of 435 runners. Pay attention to PokerNews throughout the day to get updates on the conclusion of the tournament.